Ongoing care and oiling of the timber brings out and enhances its appearance as well as protecting the wood surfaces from wear and tear. 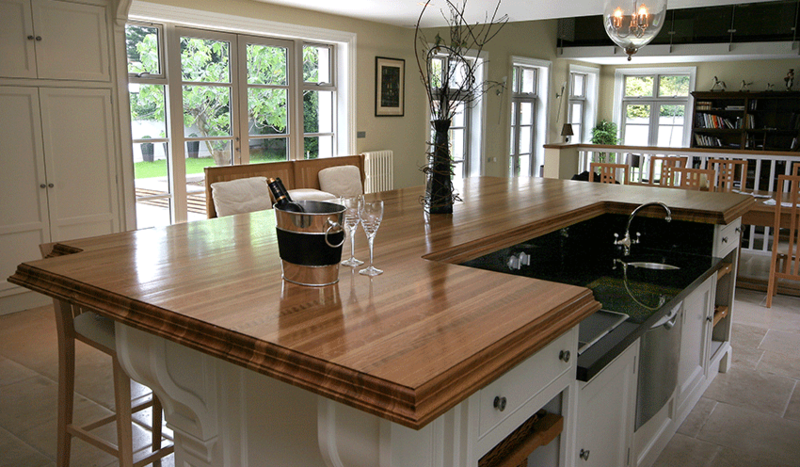 Your new worktop should be treated with oil at least once every year. This simple procedure will maintain the colour and lustre of your hardwood worktop and keep it looking as good as new. Just remember to always apply thin layers using a lint-free cloth and remove any excess oil. You can test your worktop anytime to see if it requires re oiling. This is a simple and easy procedure. Firstly, to determine if your surface needs treatment, just sprinkle a few droplets of water on it. If the water pearls, like on a newly waxed car, then it is in no need of treatment. However if the water is absorbed into the surface please follow the instructions that are to follow later on in this post. Any liquids should be mopped immediately from the timber worktop. Don’t let any liquid soak into your worktop as this might stain. Worktops should be cleaned regularly using washing-up liquid and warm (not hot) water. Apply the water sparingly and wipe dry afterwards – water should never be left to stand on wooden surfaces for long periods. Avoid using multi-purpose sprays or cleaners as the chemicals in these products may damage your worktop. The following steps can be carried out to maintain and repair your timber worktop; this can be carried out once a year to maintain the quality of your worktop. Wash your surface using warm water, cleaning away any dirt or residue. Allow to dry fully for 2 hours. When your surface is completely dry, lightly sand it with the Sanding Sponge included in care kit, making sure to sand in the direction of the grain. DO NOT APPLY PRESSURE THIS IS JUST TO REMOVE Top Fibres You should achieve a velvet like finish. When sanding is complete, ensure you remove all dust thoroughly from you surface with a Lint Free Cotton Cloth and that the surface is fully dry. Use Rubber Glove Supplied Using the Cotton Cloth Apply the Monocoat High Traffic Protector Soap* to the Cloth Not Directly on Top, Apply In Direction of Grain Full length in a Straight Line. When the Entire Surface is completely Treated, Allow surface to dry fully overnight for best results. For a full professional sanding and re-oiling please contact our office for details. We have different options for you to choose from and we would be more than happy to send you on our pricelist. 5 Ways You Can Improve Your Kitchen In February!